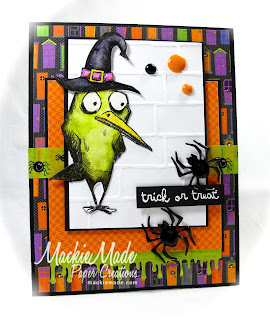 MackieMade Paper Creations: Bird Crazy! YES!!!! I could not resist any longer! I broke down and got THE birds and all their crazy stuff! But I am so glad I did. These birds are a hoot to play with!!! 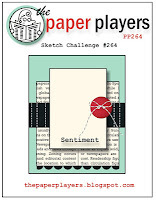 And I used their fabulous sketch from last week! Hope you like my crazy birdie! Yes, I do like your crazy birdie! :-) I don't have any of those quirky birds, but seeing your card sure makes me want to buy some! Such a fab Halloween card, Mackie! Mackie this is such a fun card! Glad you went bird crazy! Okay now how FUN is this!! That bird cracks me up with the way it's looking at those spiders!! What a fun Halloween card Mackie! That bird is a hoot! This is an adorable card! This stamp is on my wish list too! Adorable ...I love this card! You know how many times I had those birds in my cart with the extra goodies ....so many times ! I am sure you are going to love this set! Your first card is wonderful ! I love it! Your birdie with witch's hat is just too cute and those shiny spiders look like they are about to be eaten I think! I love the colours and textures on your card. Great use of last week's sketch too! 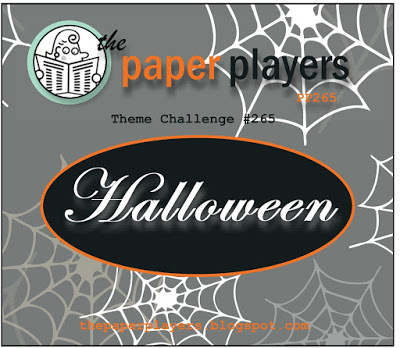 Thanks for joining my Halloween challenge over at The Paper Players this week! Win-worthy for sure ... what a fun design. 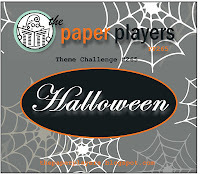 Hi Mackie, this is FAB Halloween card! Great scene!!! Super cute card Mackie. Love the bird! I was just looking at the set today! Such rich and vibrant colors. Paper Sweeties October Release Party!